With Iraq’s May 12 parliamentary elections nearing, the coalition of Iranian-supported militia groups called Fateh Alliance is confident that it can translate its military gains into a political victory by either winning the premiership or playing kingmaker in the post-election government formation process, according to Tasnim News Agency, an outlet affiliated with Iran’s Revolutionary Guards. “The next prime minister will be someone chosen by the Fateh Alliance or selected in accordance with conditions set by the Fateh Alliance,” said Qais al-Khazali, the secretary-general of Asa’ib Ahl al-Haq, an anti-American and pro-Iranian militia group within Iraq’s Popular Mobilization Forces (PMF). Hadi al-Amiri, who is the head of the Iranian-backed Badr Organization and leads the Fateh Alliance, also sounded optimistic and admitted that the coalition aims to further the cause of the Iranian Revolution. “The current project is separate from the project of Hashd al-Shaabi [PMF]. This project is called Fateh, which is the same project of Imam Khomeini,” Amiri noted, referring to Grand Ayatollah Ruhollah Khomeni, the founder of the Islamic Revolution in Iran. Amiri’s remarks came after Muqtada al-Sadr, a prominent Iraqi Shiite cleric and politician, criticized Fateh Alliance leaders for misusing the PMF name for electoral purposes. According to Hanin al-Qadu, a leader of the alliance, the formation of the next Iraqi government will be a lengthy process. He stressed that the next prime minister will have to adopt a broader platform agreed upon by different factions and will not be able to implement the his electoral one. He also opined that Western governments and key regional actors would mediate between different factions to help form a new coalition government. But Mohammad al-Sahyoud, a candidate from the State of Law Coalition, said it would not take a long time to set up the next government. He, however, agreed that the next government would be a coalition one established by like-minded factions. With ISIS militarily defeated, Tehran and its allies in Iraq have stepped up efforts not only to consolidate their latest military gains but also translate them into political power and are setting their sights on the upcoming elections. Several prominent Iranian-backed PMF Shiite groups recently formed the Fatah Alliance to contest the vote. In January, Iraqi Prime Minister Haider al-Abadi’s announcement on forming a coalition with the Fatah Alliance triggered angry reactions and deep concerns inside and outside Iraq. Shiite Iraqi nationalist leaders such as Muqtada al-Sadr denounced the political alliance, and as a result, the coalition quickly fell apart. Soon, the Wisdom Party, led by prominent cleric and politician Ammar al-Hakim also withdrew from Abadi’s coalition. According to Iran’s Fars News Agency, Hakim’s Wisdom Party and Amiri’s Fatah Alliance will run independently in the elections but are likely to form a coalition after the polls. But Hakim has stated no such plans yet. The participation of Iran-backed militia leaders has provoked concern among Iraqi Sunnis who have been persecuted and marginalized by these sectarian groups in the past. 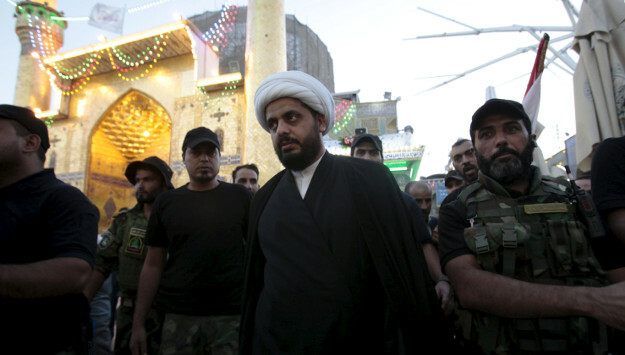 Shiite nationalist leaders and civil society groups in Iraq are also alarmed. The Iraqi newspaper Al-Jarida recently wrote that the Amiri-led alliance is an Iranian effort to impose its will on Iraq. It added that the Badr Organization, Asa'ib Ahl al-Haq, and Harakat al-Nujaba "constitute the nucleus of the Mujahideen Alliance” – referring to the initial name of the coalition. And as Amiri’s remarks indicate, Fateh leaders are not shy about their connections with Iran and the Iranian revolutionary causes. While groups such as Asa’ib Ahl al-Haq and the Badr Organization are engaging in politics, they are keeping their militia forces within PMF. In March, Iraqi Prime Minister Haider al-Abadi issued a decree formalizing the inclusion of the Hashd al-Shaabi forces in the country’s security forces. According to the Abadi’s order, the paramilitary forces will receive equivalent salaries and other benefits as the country’s military personnel under the Ministry of Defense. The announcement by the Baghdad government came despite repeated warnings by Washington and regional Sunni states about the growing power and influence of the PMF, particularly units linked with Iran’s Revolutionary Guards. But several PMF commanders with close ties to Tehran rejected reports that the paramilitary forces will be merged into the Iraqi security forces – stressing that the PMF will remain a separate military entity. Khazali said PMF leaders want the paramilitary force to remain a separate military institution, yet they are also entering the political field to consolidate their power even further. Iran’s allies in Iraq have also indicated that they would push for the “expulsion” of American troops from the country once they consolidate their power within the next government and parliament. Khazali recently stressed an election victory would further strengthen the PMF and pave the way for the US exit from Iraq.